Step 1: Open iTunes on your computer and connect your iPhone/iPad. Step 2: Click on your device tab in iTunes at the upper left corner. Step 3: On the left side bar, there are some categories under On My Device. You can double click each category to view the files on iPhone. One of the best ways to bypass all of these restrictions with iTunes is to use a media manager built by a third-party. iMyFone TunesMate Media Manager is a really good application that you can use for this. 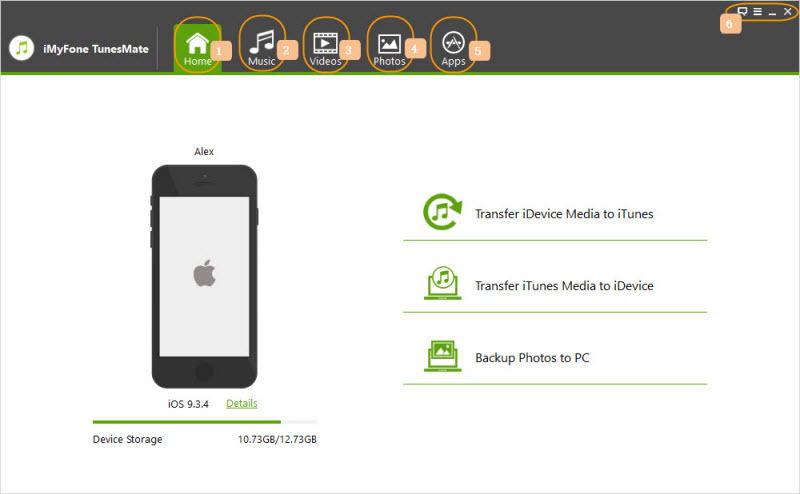 It supports almost any kind of media file and gives you a lot of freedom to transfer music, photos, videos, and more. Access iPhone Media Files: You can access almost any kind of media files, including music, movies, playlists, podcasts, audiobooks, iTunes U, etc. Manage iOS 11 HEIC Images: View HIEC photos for free on PC/Mac; transfer or manage HEIC. Two-Way Transfer: Freely transfer files between iPhone and computer/iTunes, without any loss of data. Share Purchased Files: You can share your purchased files to unlimited iOS devices, even in different Apple IDs. Step 1: Download and install TunesMate. Plug your device into your PC and launch the TunesMate application. 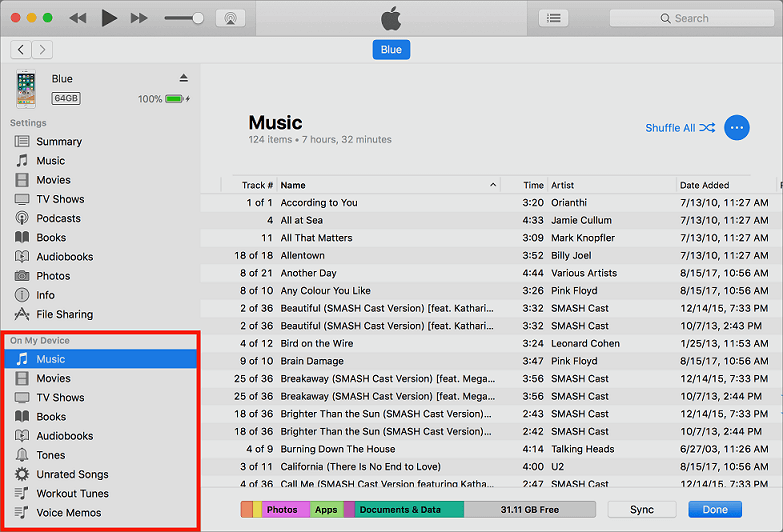 Step 2: You will see a list of different file types near the top of the screen—Music, Videos, Photos, and so on. Choose what type you want and you can access the files. Music: You can access, transfer and edit music, iTunes U, playlists, podcasts, audiobooks, etc. Videos: You can access, transfer and manage movies, iTunes U, podcasts, TV shows, home videos, music videos, etc. Apps: You can access and control all the apps in your device. There are also third-party iPhone file managers out there that you can use. The difference here is that the focus is on a number of different file types that are not necessarily media. One file manager that works great is iMyFone Umate Pro Win or Mac which can access many different kinds of files in iPhone and iPad. 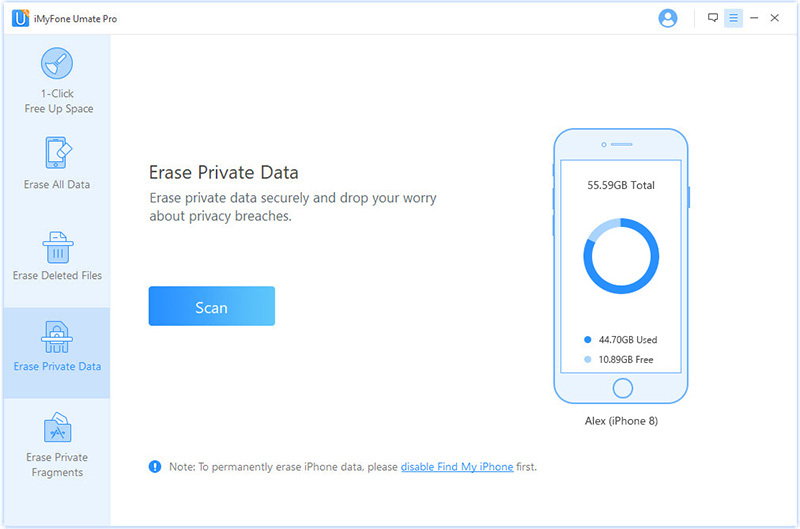 Current & Previously Deleted Files: You can access and view almost all existing and deleted data on iPhone/iPad, like messages, notes, contacts, Safari data, voice memos, reminder, Safari history, call history, chat history, etc. Media Files: Photos, videos and large files (including audio and video files) can be directly accessed on PC. Third-Party Apps: The chat history in 3rd-party apps like WeChat, WhatsApp, Viber, Kik, etc. can be viewed and managed on PC, including messages and attachments. Step 1: Download and install Umate Pro from the official iMyFone site. Step 2: Plug your iPhone or iPad into your computer, then launch Umate Pro. Step 3: Look on the left sidebar and you will see the different types of options, like “Erase Private Data”. Step 4: Hit “Scan” to start analyze. Then you can view your iPhone private data on it. Step 5: If you want to permanently delete some data, select and hit “Erase”. Another one of Umate Pro’s main functions is that it can permanently erase data. This means that it can help protect your privacy by removing personal information in such a way that it is unrecoverable, even by hackers.